That sets me into thinking. Hence, I did some research by googling it. Based on my research, some prehistoric turtles had teeth but modern turtles have real teeth. But baby turtles are born with a tooth referred to as a “hatchling tooth” or “egg tooth”. Baby turtles use hatchling tooth to break open their eggs. After they are out of the eggshell, they lose this tooth soon. Here are the research links I found at http://animalquestions.org/reptiles/turtles/do-turtles-have-teeth/ , http://scienceline.ucsb.edu/getkey.php?key=0 , http://www.themalaysiantimes.com.my/do-turtles-have-teeth/, https://cobras.org/8-amazing-turtle-facts/# , https://www.youtube.com/watch?v=JlBhtxF_NyU. In conclusion, I believe that the pre-historic turtles are still alive somewhere in the remote part of the sea. Thus pre-historic turtles are found in modern times with their strong intrinsic values. 2 Responses to Does turtles have teeth? There is precedence for this question in the artist/cartoonist world, however. 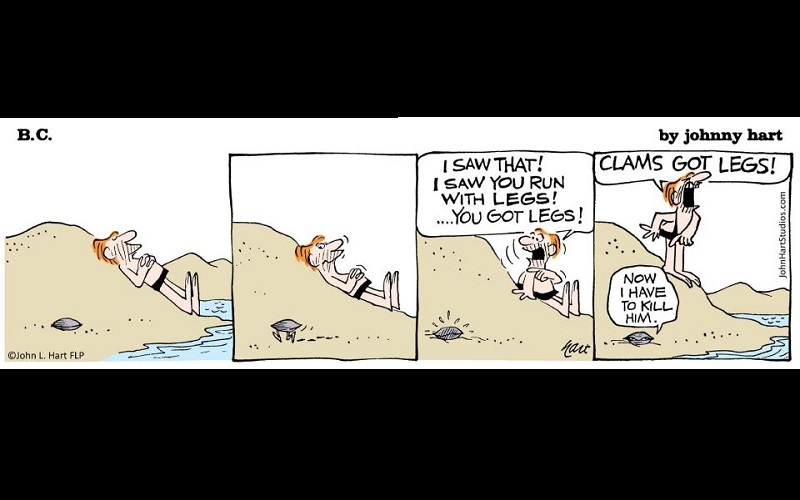 The iconic John Lewis Hart comic strip “B.C.” often touched on the meme “Clams have…” which covered everything from hands and legs to scruples and, yes, teeth! Rev, I feel so privileged for you to take the time to read my article about the existence of teeth. It is a very funny example in a comical form.